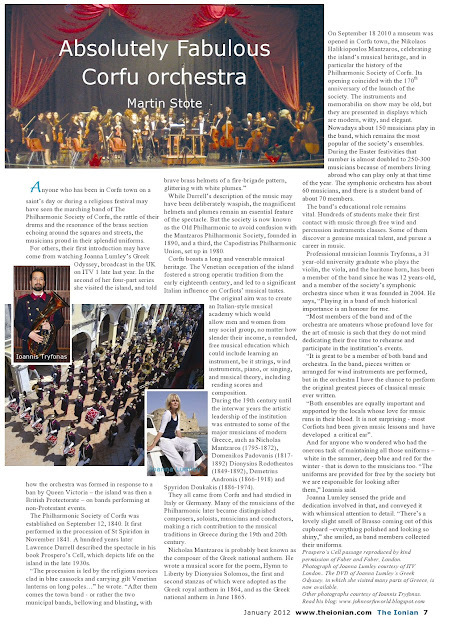 The Ionian magazine kindly published an article about the oldest philharmonic society in Greece in their January 2012 issue. I have contributed to the article by providing two photos and making some remarks about my experience as a member of this band. Also it features a brief history of the philharmonic and mention a passage from reknown british writer Lawrence Durrell's desciption of a typical corfiot religious procession in his "Prospero's cell" novel.